Happy Weekend! Can you believe it’s already February? 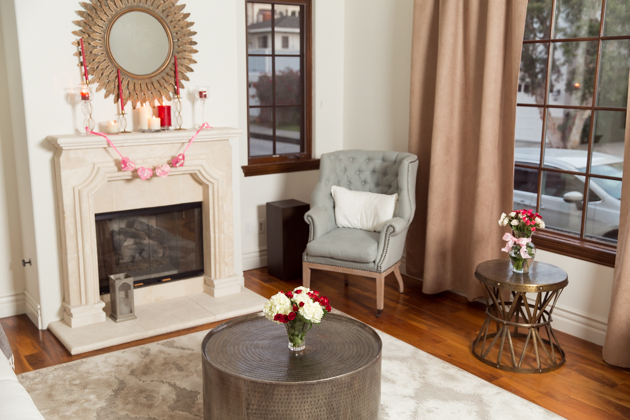 I started decorating for Valentine’s Day early this year to have the place ready for my Galentine’s Day Soiree last week. 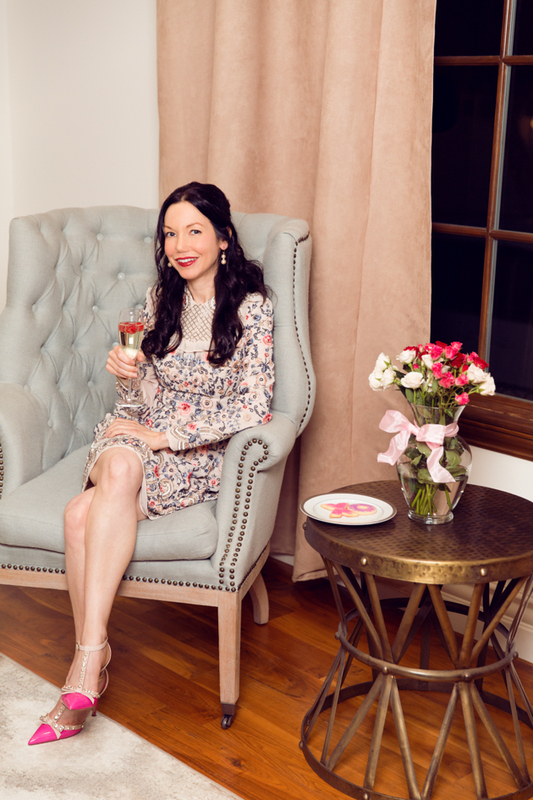 I’ll have those photos up on the blog next week, but I wanted to get a quick post up with some Valentine’s Day décor inspiration for those of you planning your own celebrations. Do you gals also spend hours searching Pinterest for party inspiration? I’m obsessed with Camille Styles and Fashionable Hostess. These ladies blow me away with their creativity! 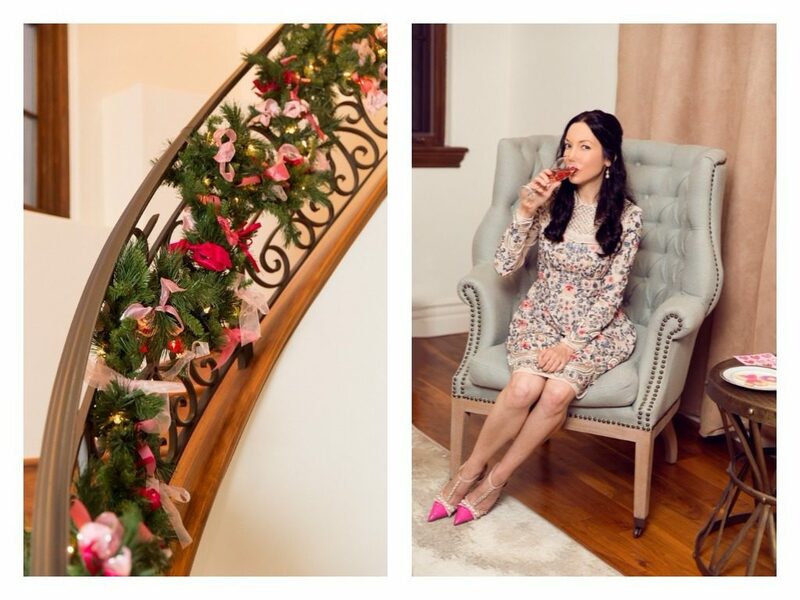 Of course if you’ve been following along on my blog for awhile though, you’re probably not surprised by how much I love decorating for the holidays! These DIY Bow Garlands are a project I made years ago… It was before I had a blog, so let’s just say I had more tie on my hands. 🙂 The garlands were inspired by the late Juicy Couture store on Rodeo Drive (may it rest in peace), which at the time I considered my second home. 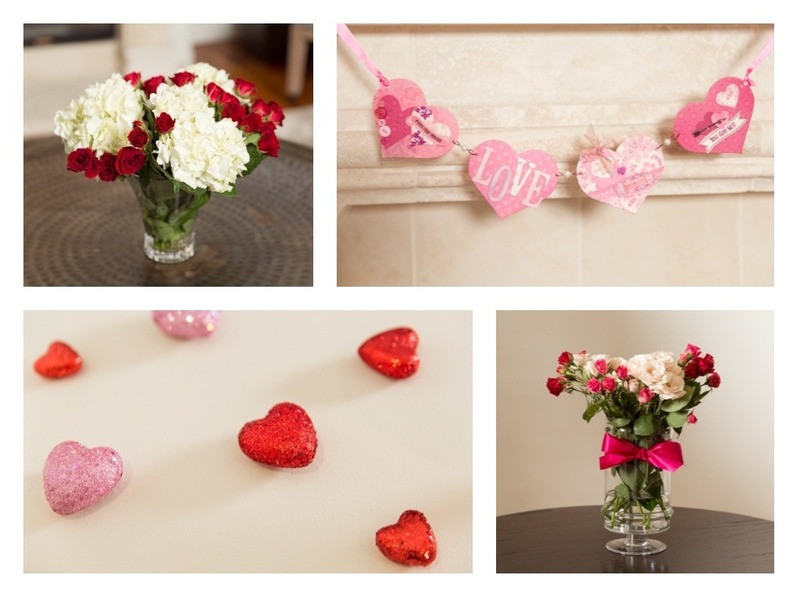 I always loved their uber-feminine décor and thought the garlands would be a perfect decoration for a Valentine’s Day party I was throwing. 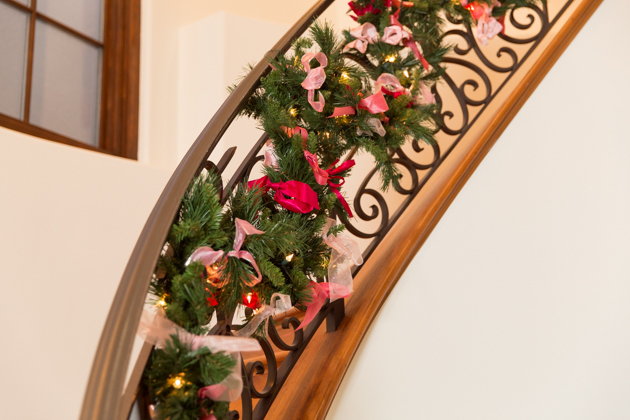 Simply tie an assortment of pink bows along a plain garland and then run a strand of white lights throughout. I used about 7 different ribbon variations in different widths, textures and shades. My favorite is the wire rimmed ribbon as it’s so much easier to reshape after it’s been in storage. I also created a couple of extra garlands to place over the mantels in my library and family room. 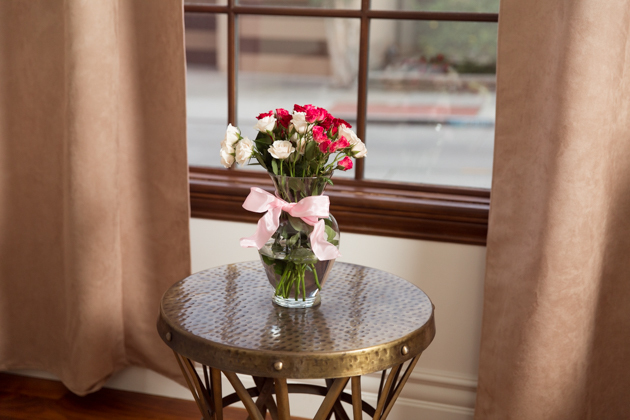 Don’t worry about spending a fortune on floral arrangements. You can find reasonably priced flowers at your local farmer’s market, flower mart or Trader Joe’s. I used ribbon left over from my garlands to add pretty bow’s to my arrangements. I found this heart garland at a paper store years ago. You can find similar ones here and here, or you can make one yourself. 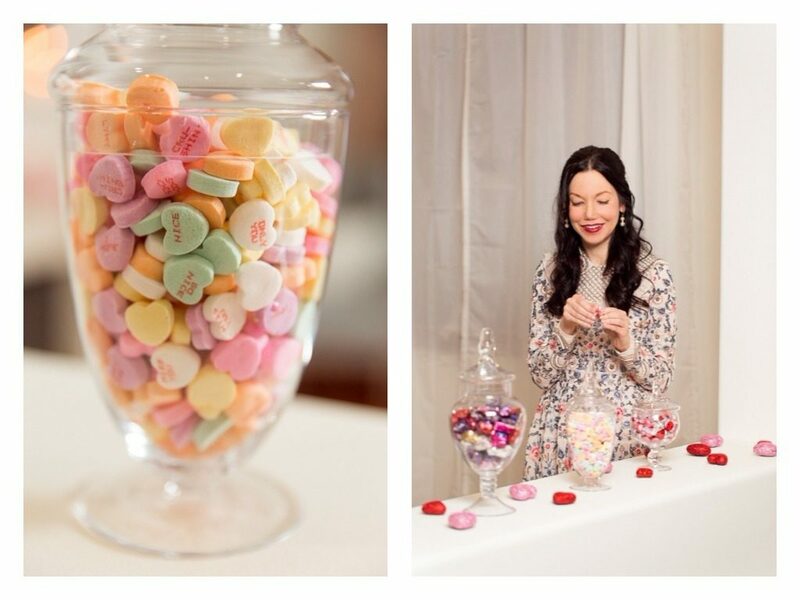 And this candy buffet is quite the Conversation Heart piece. 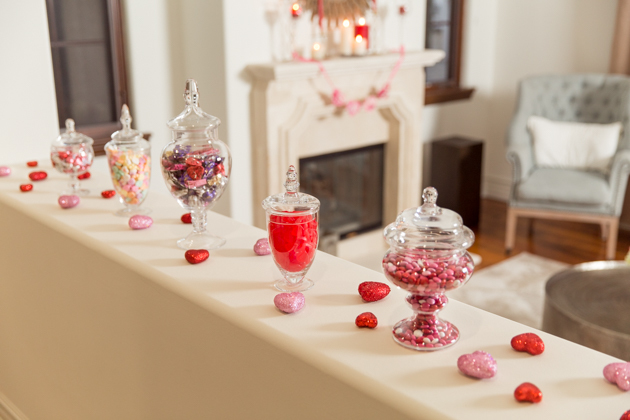 It went over extremely well with my guests with the M&M’s and Swedish Fish Valentine Heart’s being the most popular. I bought little treat bags so everyone could mix and match their favorites. 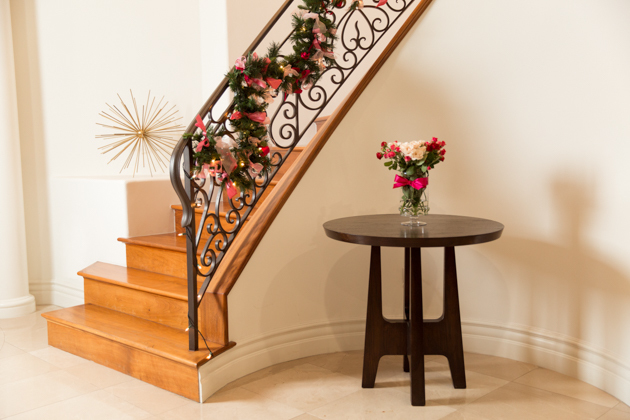 I hung glitter hearts from my sconces and on the railing of my banisters. And in case you missed it, the recipe for these gluten and grain free sugar cookies is detailed in my previous post. 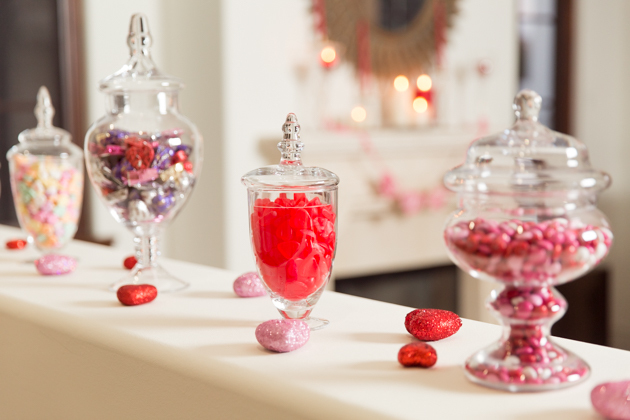 Are you decorating for Valentine’s Day this year? I’d love to see your décor! Please send me a link so I can pin you in my Entertaining Ideas board. 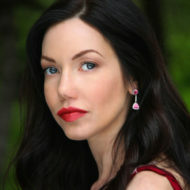 PS: Have you entered the Nordstom Giveaway yet? Only 4 Days left. See original post here. Great inspo. Thanks for sharing. Thank you Esraa! I really love decorating! 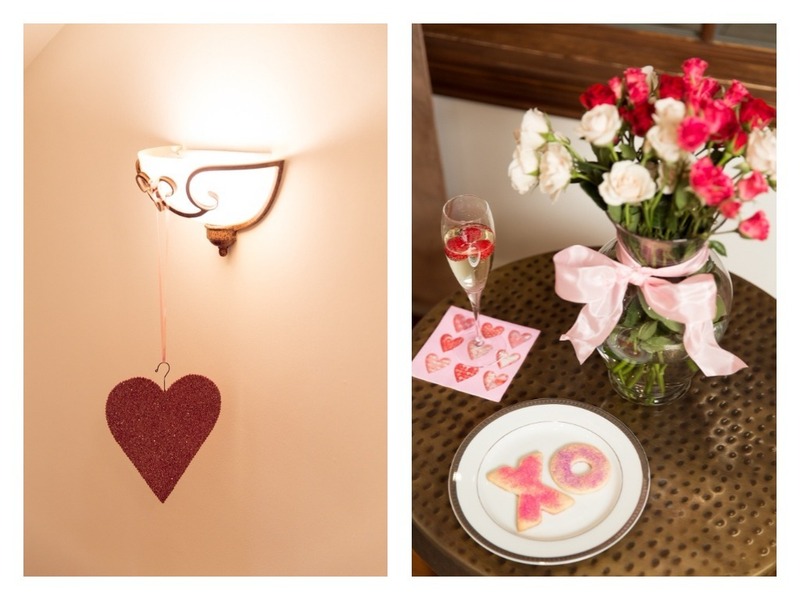 Gahh, love your Valentine’s decor! So pretty and feminine and I love that you created it all yourself! Thank you so much Kali! So sorry you couldn’t see it in person, but I’m looking forward to Galentine’s Day with Baby P next year!